When your ankle mobility is compromised, it makes training difficult and can even make you susceptible to injury. If addressed appropriately, though, you can correct these problems through ankle range motion exercises and improve your mobility, not just in your ankle but all through your body. Some of the common exercises that are compromised by poor ankle mobility are lunges, squats and deadlifts. 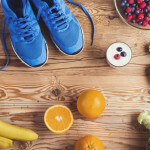 Without full range of motion in the ankle, the knees and hips will compensate, and this can create a potentially dangerous combination of factors. Most people have impaired ankle mobility but the good news is there are ankle range of motion exercises to improve them. There could be a number of reasons for poor flexibility and strength. Maybe somewhat surprising a number of areas can be problematic. The ankle is a complex structure made up of the talocrural joint, the tibiofibular joint, and the soleus, flexor hallicus longus, flexor digitorum and posterior tibialis muscle groups. Any one of these parts can be the source of limited range of motion. Put one foot about four inches from the wall. Keep your foot straight. Now try to touch your knee to the wall. If you can do it without twisting your knee or moving your foot (either side to side or lifting your heel), then you have full range of motion. Bone spurs are osteophytes that form in the joint spaces or in the areas near the ankle and foot joints. They can cause limitations to mobility, especially in dorsiflexion. 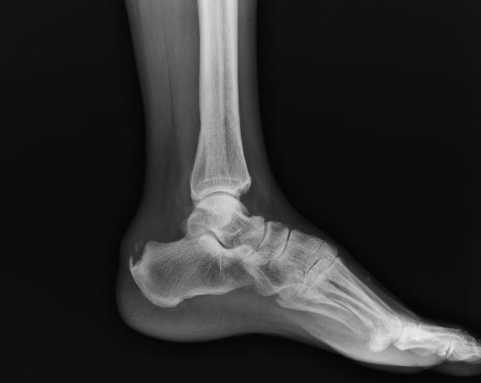 Bone spurs can only be diagnosed by x-ray, can only be corrected with surgery, and not through ankle range of motion exercises. The most common points for joint limitations are in the talocrural joint (the ankle) and the tibiofibular joint, which isn’t technically part of the ankle at all. It does, however, have to mobile to allow the ankle joint to move properly. If the tibiofibular joint won’t move properly, then the talus can’t clear the distal end of the tibia during dorsiflexion. As a result, there is a loss of mobility and a feeling of pressure or pinching at the front of the ankle. Luckily, joint limitations can be addressed non-surgically. 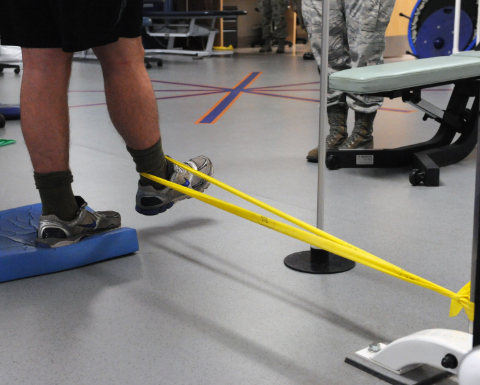 Take an exercise band that has been anchored about five to six inches above the floor. Bring the band forward until there’s a decent amount of tension and put it around your ankle, right at the top of the ankle bones. Move your knee forward without letting your heel rise from the ground. Do this about 8 to 10 times per ankle, holding the position for two to three seconds each time. 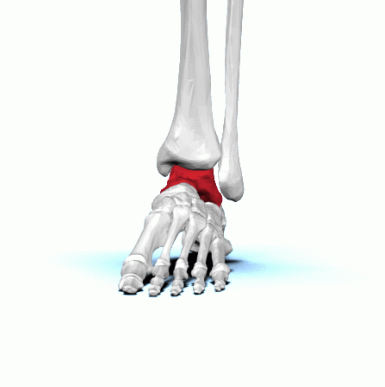 Put the web of your hand at the level of your ankle, right at the ankle bones. Push from front to back as you bring your shin toward the front. Do this 8 to 10 times per ankle holding the position two to three seconds each time. Kneel with one foot flat on the floor. Put your hands around the top of your lower leg, just below the knee and apply a moderate amount of pressure. Internally rotate your lower leg while at the same time bringing the shin forward without lifting your foot. Don’t do this exercise if you experience knee pain. Repeat 8 to 10 times per leg. When you do the mobility test, if you might feel tightness or stretching in your calf or Achilles tendon and you can’t reach the wall, then you might have increased tone in your soft tissues. To improve your range of motion when your soft tissue is the culprit, try myofascial release techniques. Examine the back of your lower leg (the posterior tibial tendon). Once you’ve located a spot that’s tender to the touch or where you can feel a knot, then use your thumb or a baseball and apply pressure to that spot while you flex and extend your ankle. Don’t do more than 15 reps, though – you don’t want to cause bruising, which will exacerbate the situation. You can also use weight plates to help loosen the tendons. Put the plates flat on the floor and stand with the balls of your feet on the weights and your heels on the floor. Flex and extend your ankle joint. If you’ve tried the modalities listed above and you still can’t fully perform the wall mobility test, then you might need to look for some professional assistance from a physical therapist or massage therapist. Some exercises that help you to maintain your mobility after you’ve done the ankle range of motion exercises are box squats, goblet squats, goblet squats with weight plates, deadlifts, sumo deadlifts, trap bar deadlifts, and rack pulls. It’s important to strengthen the newly released and mobilized small muscles around your ankle. This can help prevent mobility loss in the future.